Click the element directly in the chart to select it — use the ScreenTip that appears at the mouse pointer to identify the chart object before you click to select it. Click the name of the chart element on the Chart Elements drop-down list in the Current Selection group on the Format tab — Excel shows you which element is currently selected by displaying its name inside the Chart Elements combo box. After you select an element in the chart by clicking it, you can cycle through and select the other chart elements by pressing any of the arrow keys. You can tell when an element is selected in the chart itself because selection handles appear around it and its name appears in the Chart Elements box on the Format tab. Format the element by selecting the appropriate command button in the Shape Styles group or by clicking the Format Selection button in the Current Selection group to open the Format dialog box for that element and use its options to make the desired changes. Move the element within the chart by positioning the arrowhead pointer over the element and then dragging it around. With some elements, such as the legend, you can use the selection handles to resize or reorient the object. Remove the element from the chart by pressing the Delete key. 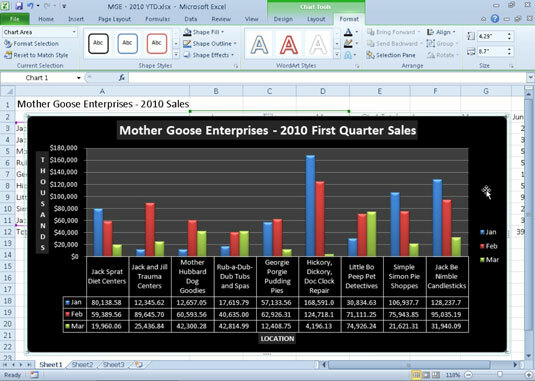 Use the Chart Tools Format tab to format existing chart elements. All chart elements have shortcut menus attached to them. If you know that you want to choose a command from the shortcut menu as soon as you select a part of the chart, you can both select the object and open the shortcut menu by right-clicking the chart object.